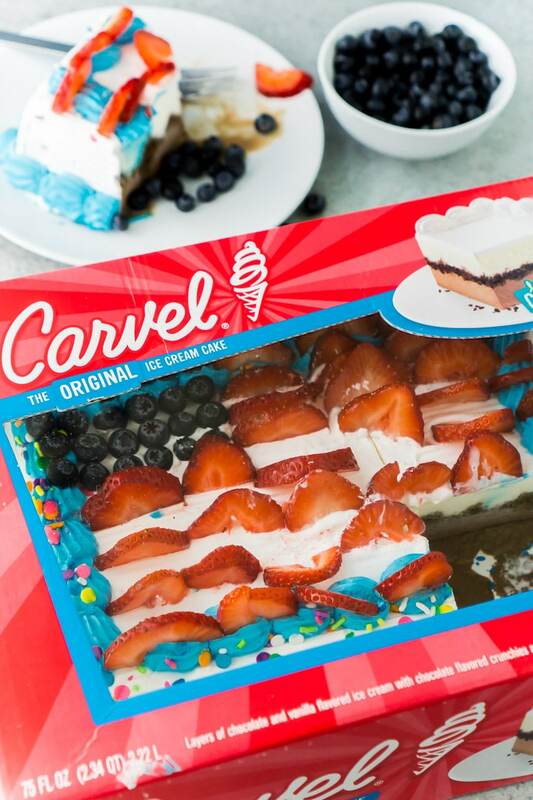 Turn everyone’s favorite Carvel® Ice Cream Cake into an American flag cake for 4th of July with a few pieces of fruit and this simple tutorial! 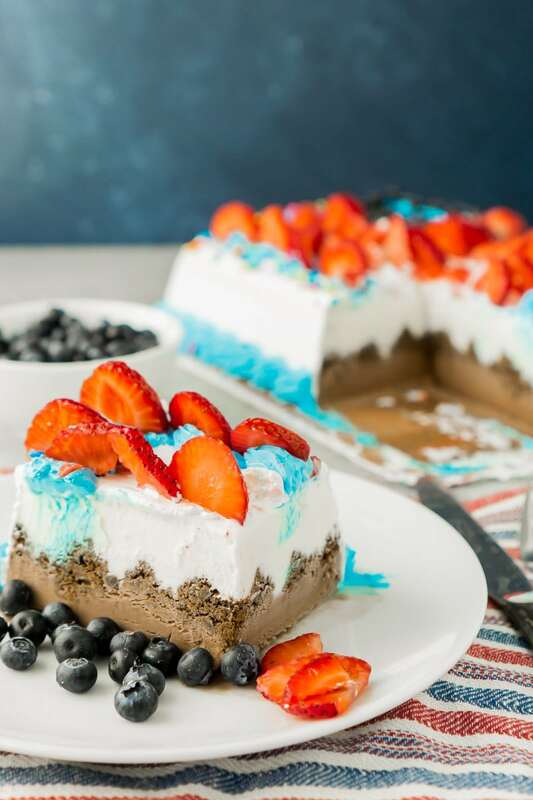 There’s nothing better than an ice cream cake on a hot day, and this red white and blue cake will impress guests while also cooling them down on a hot day! This post is sponsored by I Love Ice Cream Cakes. All opinions and ideas are 100% honest and my own. One of my all-time favorite desserts (other than striped delight) is ice cream cake. There’s just something about having your cake and ice cream together that just hits all the right dessert notes for me. The problem is that ice cream cake is not particularly easy to make, and it’s time-consuming with all that frosting making and ice cream freezing. So I’ll tell you a secret. I never make homemade ice cream cake. I always buy it at the grocery store. And it probably tastes better that way anyway because the people who make the Carvel Ice Cream Cake and OREO® Ice Cream Cake options you can buy at the store are the experts. And I’m all about letting the experts do what they’re best at while I do what I love. Essentialism at its best. 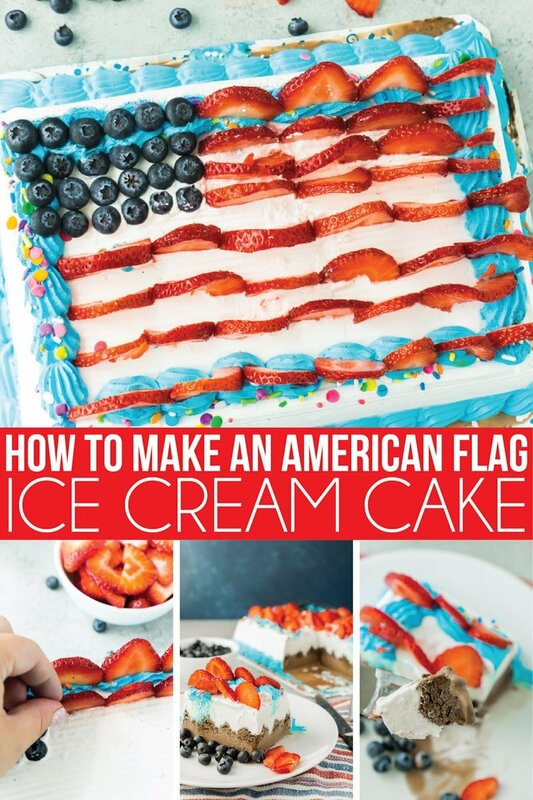 Instead of making a homemade ice cream cake that would take me who knows how long, this year for 4th of July, I’m turning a store-bought ice cream cake into an American flag. Showing a little bit of homemade effort can go a really long way when it comes to entertaining. I mean making things semi-homemade is one of my top 4th of July party planning tips after all. So here’s a quick tutorial on how to turn one of my favorite ice cream cake desserts into a very patriotic one that tastes even better with a little fruit! You start with what else, an ice cream cake! 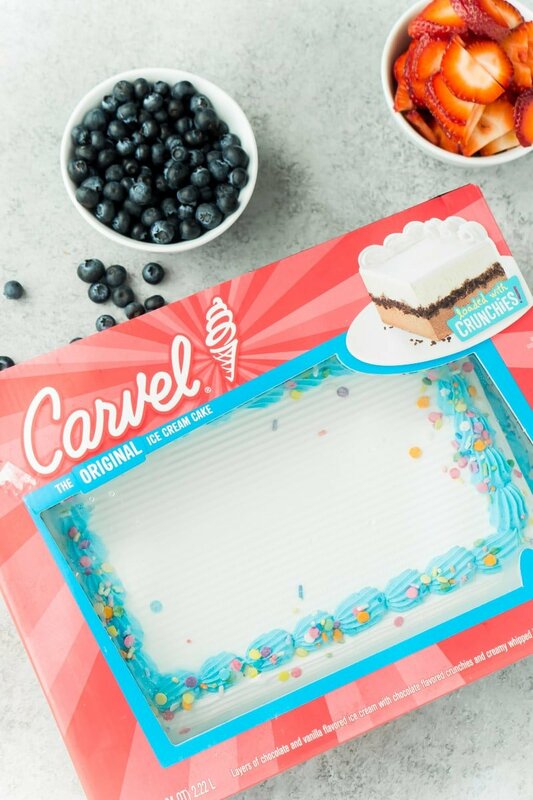 I went with a typical family size Carvel Ice Cream Cake from Kroger in the bakery section, but you can check out I Love Ice Cream Cakes to see which products are available at your local grocery store! They have all sorts of delicious frozen ice cakes for all occasions including Carvel and OREO cakes! The best thing is that the I Love Ice Cream Cakes come in different sizes and styles so they work for any size party you want to host. And they’re available in grocery stores nationwide in either your bakery or freezer section. So just pick one up when you’re doing your grocery shopping for your 4th of July party. And if you’re as big of an ice cream cake fan as I am, make sure to sign up for the Crunchie Club for I Love Ice Cream Cakes product updates, coupons, and more! While you’re shopping, pick up some fresh blueberries and strawberries as well! And that’s it. That’s all you need to make this simple American flag cake. This might be the easiest tutorial ever, but that’s what I do – easy party ideas everyone can do at home. I mean I could show you how to make a cotton candy cake, but I’ll leave the fancy cakes to the experts and stick with the easy. Step 1 – wash all of your fruit! Obviously. 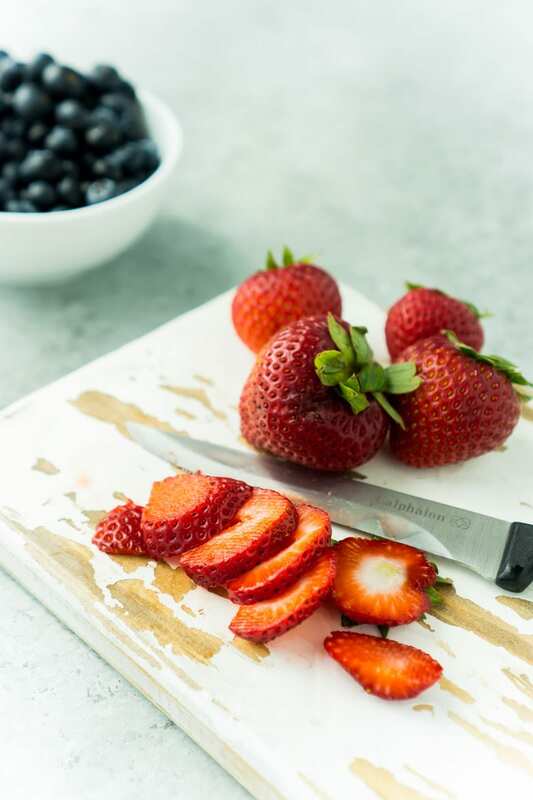 Step 2 – cut the strawberries in half then into thin but not too thin slices. You want them thick enough that they’ll stand up on the cake. Step 3 – create the stars portion of the flag by adding four rows of six blueberries each. If you want, you can try and scrape off the blue icing from the Carvel Ice Cream Cake, but I personally like the ice cream, so I left it. 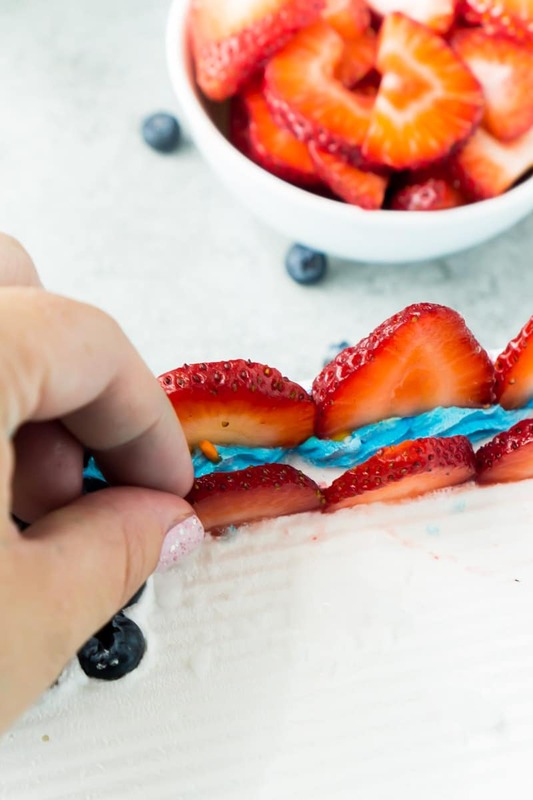 Step 4 – Add sliced strawberries in lines to create the red and white stripes of the flag. You can decide exactly how wide you want your stripes, but I recommend three red stripes next to the blueberries and six red stripes underneath. This will again depend on the thickness of your strawberries; the idea is to just make it look like red and white stripes with red starting the flag and white ending. You’re done! 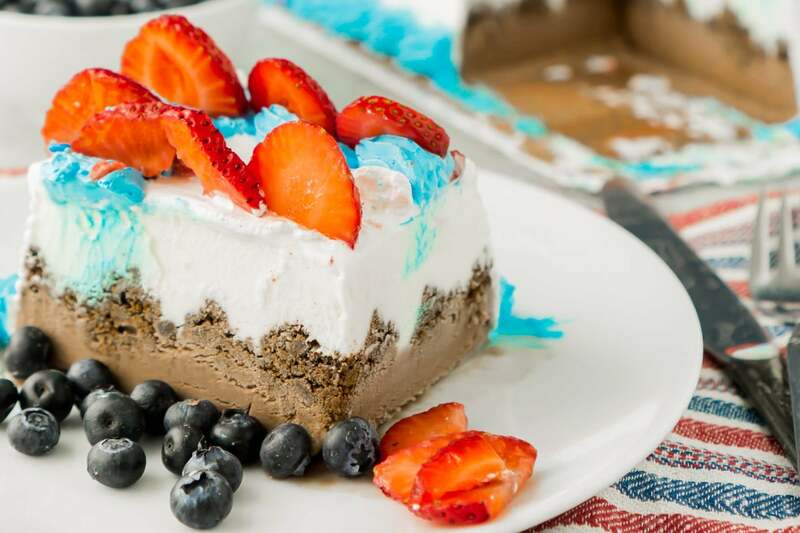 Enjoy a piece of your very own 4th of July ice cream cake! Step 5 – Put back in the freezer if you’re not eating right away; just don’t put it in for too long or you’ll end up with hard frozen fruit. You want frozen ice cream and edible fruit. 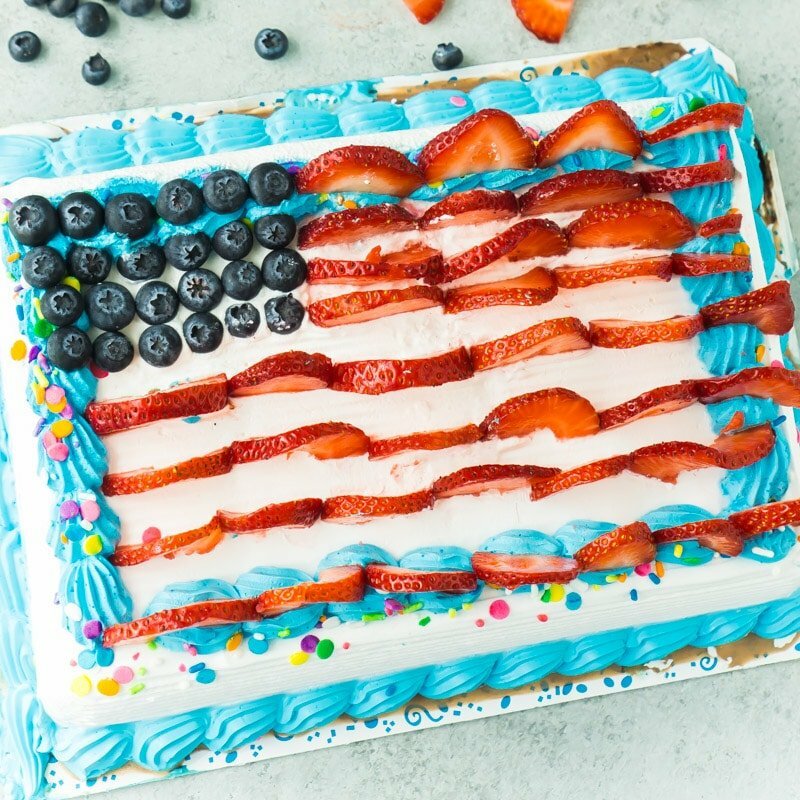 If you don’t want to make an American flag cake or want more sweet ideas, check out these party tips for more great ways to use an ice cream cake and other fun 4th of July party ideas!